The Daily Herald has published racist content three times in as many weeks. By M. Dzhali MaierAll Native Americans should celebrate Columbus Day, even if they have reservations about honoring Christopher Columbus himself. Columbus DayColumbus Day was first enshrined as a legal holiday in the United States through the lobbying of Angelo Noce, a first generation Italian, in Denver. The first statewide Columbus Day holiday was proclaimed by Colorado governor Jesse F. McDonald in 1905, and it was made a statutory holiday in 1907. In April 1934, as a result of lobbying by the Knights of Columbus and New York City Italian leader Generoso Pope, Congress and President Franklin Delano Roosevelt proclaimed October 12 a federal holiday under the name Columbus Day.The holiday is first about Italian-American pride in "discovering" America and second about American pride in being "discovered." I'd guess the exchange element became a factor only in the last couple of decades. You know, when people begin reassessing Columbus and realized he was more of a conqueror than a discoverer. Regardless, the day is still mainly about him and his "discovery." So don't tell Natives what they should celebrate. The issue is what we do celebrate and whether we should celebrate it. If the point of Columbus Day isn't obvious, consider how Americans throw tantrums whenever someone renames "their" day. Like Columbus Day, Indigenous Peoples' Day could be about the "Columbian Exchange," but white folks would never buy that. They want to "honor" their whiteness, not some fair and equal exchange between Natives and Europeans. Every plant except half of themJust about every plant imaginable (from almonds to cabbage, carrots to coffee, wine grapes to ginger) is Old World in origin. Wheat, soybeans and even marijuana are Old World. This wasn’t just a one-way deal. Without the Columbian Exchange, there would be no Hungarian paprika, French vanilla, Italian tomato sauce or Belgian chocolate. New World plants, such as the potato (native to South America) revolutionized the diets of the Irish, the British and the Russians.Well, that's stupidly contradictory. Every plant comes from the Old World except the half or so that come from the New World. Incredibly important world crops such as corn and potatoes were bred into existence by Native civilizations. Yet Maier can't seem to grasp that basic fact.European technology, in the modern day, enables airplanes to access remote communities of First Peoples, providing them with medicine. Plains Indians (Navajo, Lakota, Pima and Sioux, to name a few) developed a whole culture around the horse, and wild herds still run free. The fact that a student at Brown (or any other school) can email a British university, arrange to study there, fly across the pond and thrive in England is a testament to the Columbian Exchange.For starters, the Navajo and Pima aren't Plains tribes. And the horse isn't a technology. It's nice that the Europeans brought horses, pigs, and chickens while they were enslaving and killing people, stealing their land and resources. But the invaders arguably got more than they gave, so we don't need to thank them for that. A good portion of our medicine came from Native sources. Airplanes and e-mail, which seem to be Maier's prime examples, were mostly American inventions. American, not European. Europeans don't get credit for things we invented hundreds of years after they left. Americans invented things because they had land and resources (taken from Natives) and freedom and democracy (taken from Native examples). One could argue that everything they invented was a hybrid. Europeans and Asians didn't invent the same things as Americans because they didn't have the same background. They didn't have the same combination of European and Native elements. The zeal of feeling unburdened--by crown or church--was an American and arguably Native tradition. If Native civilizations had been left alone, they might've invented the same things. For instance, an Aztec computer scientist at the Tenochtitlan Institute of Technology might've come up with the first Internet protocols. When the Aztecs met the Europeans, they were both communicating by methods such as smoke signals and carrier pigeons. Who says the Europeans would've developed faster than an untouched Aztec civilization? Meanwhile, Natives might not have invented overpopulation, global warming, atomic bombs, genocide, or species extinctions. You know, because they weren't hell-bent on conquering nature and all its inhabitants like the Europeans were. So Maier's comparison is specious. You can't compare today's Europe to 15th-century Native America any more than you can compare medieval serfs to today's Native scientists and engineers. 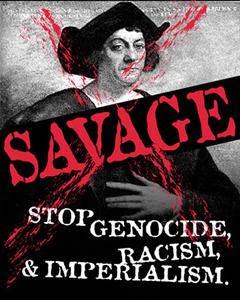 For more on Columbus, see Rise of Indigenous Peoples' Day and Renaming Columbus Day Angers Italian Americans. "White genocide" in The Force Awakens?